"A shipwrecked sailor found himself in a plight. Lost at sea he was really a sight. He swam and swam 'til he thought he'd die, when a wonderous sight appeared to his eye. A derelict boat that saved his life and put an end ot his watery strife." When Channel 45 came on the air in 1970, one of the first local programs produced was for children. Royal Parker had been approached by the station's program director, veteran broadcaster Bill LeFebvre, about hosting the show. But ultimately George Lewis was hired. "Captain Chesapeake was the moniker given to the Atlanta native who grew up in Baltimore during the 1930's and '40's, where he graduated from the old Baltimore Polytechnic High on North Avenue. Enrolling in Johns Hopkins University, Lewis decided one day that radio was his calling. So one morning instead of going to Homewood campus, he drove until he found a job at a station in North Carolina. George returned to Baltimore in 1950 to do the morning show on WCBM, then moved on again to a station in Atlantic City. Later, Lewis went into television in Lexington, KY, and by 1957 was anchoring news at WSAZ-TV in Huntington, WV. Asked one day to replace an ailing kid's show host, Lewis came up with the character "Steamboat Bill," and soon after gave up his news duties entirely to concentrate on children's programming. In the beginning, "Captain C" wore a turtleneck, blazer, captain's hat, and a pair of sunglasses. The shades were discarded shortly after production began at WBFF's original facility on Parkdale Avenue and Druid Park Drive, at the foot of Television Hill, which they shared with WFMM-FM (now WPOC). The captain's ship was called "The Television Hull," and nautical scenes appeared behind him on a blue screen. "Stumblin'" was the theme music, and Lewis appeared in live action segments with sidekicks Mondy the Sea Monster, Andrewclaws the Lion, and the unseen and incredibly irritating Bruce the Bird. Wrapped around the live action were cartoons, Our Gang, and The Three Stooges, not to mention plenty of live commercials for Drink-Me-Pop Stops and, early on, Gwynn Oak Amusement Park. 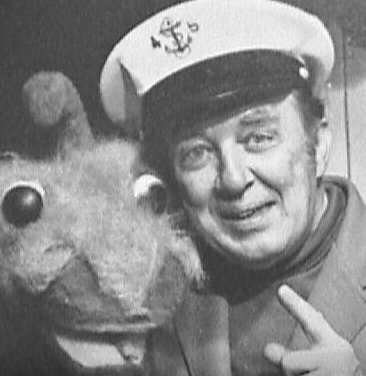 "Captain Chesapeake" aired weekday afternoons from 1971 to 1990, making it the second longest- running local kid's TV show in Baltimore history (to "Pinbusters"). In addition, taped segments featuring Lewis appeared during morning cartoons, and he was the off-camera host for Channel 45's "Roy Rogers Theatre" on Saturday mornings, once even having the legendary cowboy star as a guest on his weekday show. By the mid '70's, "Captain Chesapeake" boasted more than 50,000 card-carrying "crewmembers," and the station received as many as 3,000 letters to Lewis a week. At the end of each program, the good captain would encourage his youthful viewers to "be someone important--be yourself," then he followed with his signature sign-off, "so loooonnnnggggg crewmembers!" Retiring in 1990, Lewis spent his final years at his home in Timonium, MD, enjoying the company of family and friends, catching up on his reading, and traveling. In December, 2000, George Lewis died of bone cancer at the age of 74.